How good a cook is Rep. Betty McCollum? 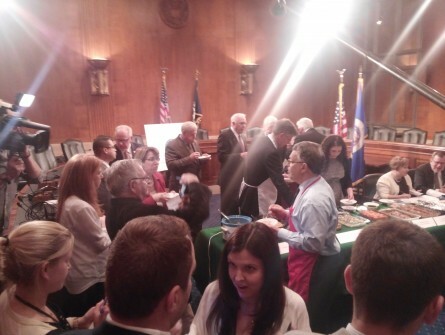 Skilled enough that the eight-term Democrat didn’t have to campaign — or even show up, for that matter — at the fifth annual Minnesota Hotdish Off to clinch congressional bragging rights. McCollum bested the rest of the delegation with a combination of savory ground turkey, cruciferous greens, meaty mushrooms and nutty wild rice bolstered by just a hint of cinnamon. “Now be prepared to get the most press you ever got,” a fellow staffer counseled the McCollum aide dispatched to collect the competition’s coveted golden casserole dish. Seconds later, he went negative. “Tim Walz is going for a three-peat here and it’s kind of obnoxious,” Franken joked after the two-time winner wondered aloud whether he had any room left in his office for another award. He also pointed out there were some new faces at the judging table — Star Tribune columnist Jill Burcum, University of Minnesota President Eric Kaler and The Hill writer Devin Henry did the honors this year — as a result of prior grumblings. “Michele felt that the judges were too tater tot friendly,” Franken said of a critique leveled against former lawmakers/aspiring food critics Gerry Sikorski, D-Minn., and Vin Weber, R-Minn., by ex-Rep. Michele Bachmann, R-Minn.
“The tater tots are deep fried. Just like everything at the state fair,” Walz, whose cordon bleu-themed dish was studded with crispy potatoes, pointed out to a staffer. Sure enough, half of the submissions featured the signature spuds. Rep. John Kline, R-Minn., bucked the system, eschewing fried tubers for homier fare. He turned to Lloyd’s Barbeque Co., located in his district, for inspiration, rolling together tangy-sweet pulled pork and buttery Grands! ready-made biscuit dough into a shredded cheese- and diced onion-enabled bake. 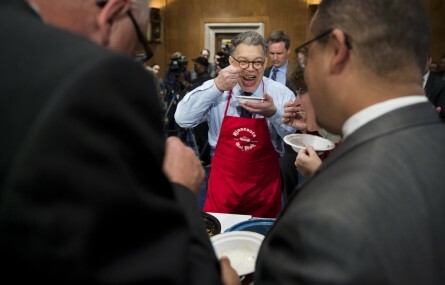 At one point, Franken, Kline, Walz, Rep. Keith Ellison, D-Minn., and eventual runner-up Sen. Amy Klobuchar, D-Minn., hovered over the tasting table, lifting heaping spoonfuls to their mouths, quickly comparing notes — “That first one is awfully good,” Franken said after sampling newcomer Tom Emmer’s culinary stylings — and then repeating the process as they inched down the line. “I don’t know how they make up their minds," one staffer posited after eyeing the options. “That’s not enough tater tots,” predicted another who’d just finished sizing up the featured selections. One Emmer staffer, who said she’d gotten up at the crack of dawn to sauté peppers and onions for use in the office’s offering, couldn’t seem to fathom how the entry — one of the first to disappear once Franken urged staff to dig in — failed to carry the day. “We had a whole bag of tater tots and a pound of beef,” she noted.